At this point, we shall continue our journey into a somewhat more interesting and somewhat less useful realm, that is to say, dealing one handed. Ultimately, I consider dealing one handed to be more a matter of showing off than one of practicality. After all, dealing two handed is virtually always possible, virtually always easier, and more convincing, why then would one wish to deal one handed? I suppose the answer lies in two areas. First, dealing one handed is a flourish of sorts and thus holds a certain interest in that regard. Second, it is psychologically more convincing as the thought that some might be false dealing one handed is much more incredible than the well known practice of false dealing two handed. I think that for myself, I like the novelty of dealing one handed, it is fun for me to lean back casually in my chair with a drink in one hand and flick cards around the table with the other. But, perhaps some do not share my enthusiasm and for those who are not interested in this practice I would certainly encourage you to skip forward to sections of greater interest. There will be little in this section of worth regarding two handed dealing that has not been covered or will not be covered in other sections. I begin with a deal that is not particularly difficult, but also not terribly practical. Not that it is a poor deal, far from it, the deal, when executed correctly is totally invisible. But rather, that it is a second deal, not easily adapted to function as a center or bottom deal (so much so that I will not even attempt to describe the process in this manuscript) and a stud deal at that. 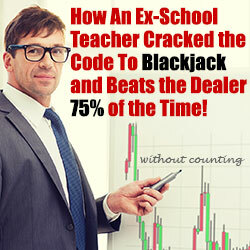 Thus, it's applications are primarily in blackjack and stud poker for all but the hole card. You may ask then why I am including it. The first reason is that I simply love it. 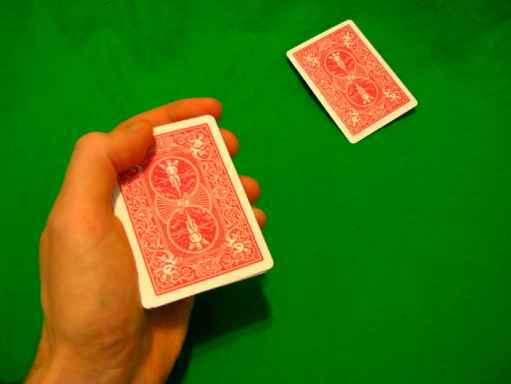 The first time I saw a video of Marlo performing it I was under the illusion that the card virtually materialized at his fingertips and originated somewhere in the middle of the deck. Second, because I think it illustrates perhaps better than any other deal the need to and difficult in creating consistency between the false deal and the real deal. As I mentioned, the false deal itself is not terribly difficult, however, making the false deal look the same as a top, or making the top look the same as the second is a challenging task that I have worked on for hours on end. 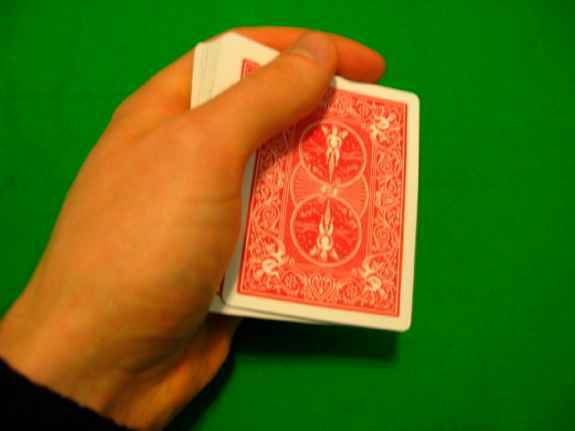 Rotate your hand at the wrist turning the deck so the faces are facing up, the regular top of the deck is facing down, in other words, your hand is palm down. 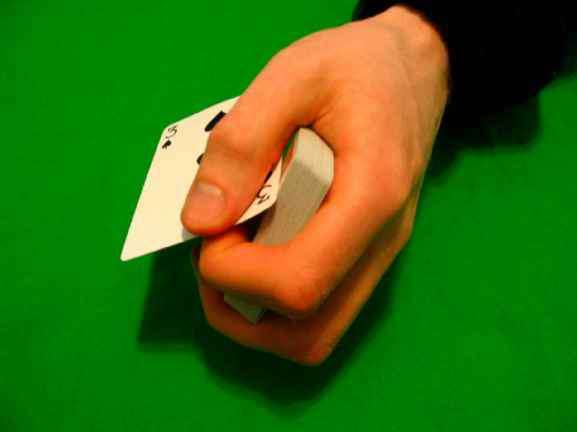 In the process of this motion, when your hand is about half to three quarters of the way into the palm down turn, use your left thumb to riffle off the top card (as you complete the turn, if you are using your right hand instead of right you will be able to glimpse the pip). Hold a small thumb break at the front left corner and rotate your hand back so it is again palm up. Now ask the audience member or player in the game etc. "would you like another card" or something of that nature depending on the circumstances (say for something like blackjack). 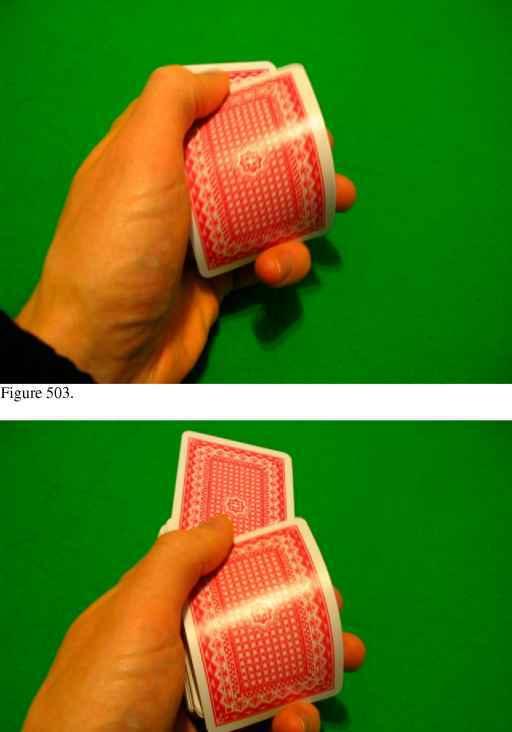 (See figure 479 for the riffling action of the thumb during the wrist turn and figure 480 for a front view of the small thumb break while asking if the player would like a card). Now that you have obtained a break below the top card, you are ready to perform the deal itself. (Note that the method I described above to obtaining a break is not necessary, it simply gives you cover for when you want to get the break under two cards instead of one and allows you to peek under certain circumstances.) A number of actions are going to occur in rapid sequence and while I will break the process down into steps, you must learn to perform the entire action extremely quickly. 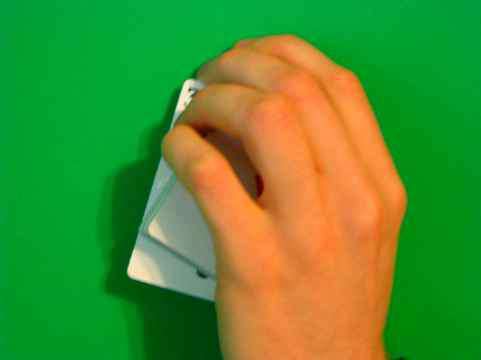 First, you will insert your thumb into the break and move it a little more than halfway across the card on along the upper edge. To describe better, your thumb tip should be roughly around the right side of the upper pip on a card with the value three. 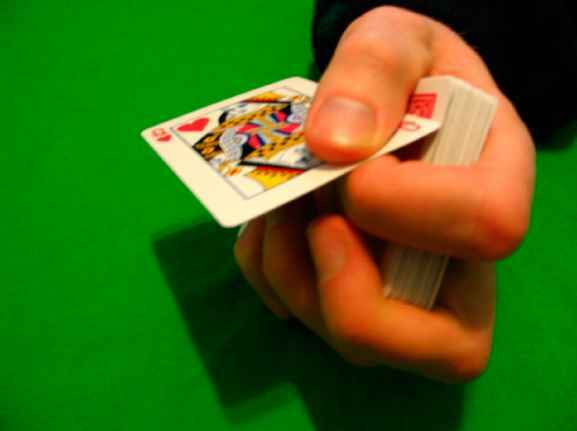 It is important that the card apparently revolves around the left edge of the deck and not in the middle, thus you need to use the forefinger in such a manner that the right edge of the card (in the initial position on top of the deck) kicks over to the left edge. This process should leave you holding the card face up between your forefinger on the bottom of the card and the thumb on the top. 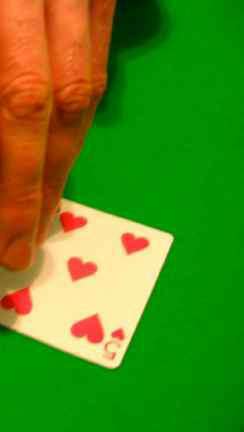 Your thumb should be pinching the card at roughly the middle position, and held roughly parallel to the upper edge. During experimentation I found that getting the correct finger position consistently was perhaps the most difficult part of this whole ordeal and so I suspect you will have to practice, alternating between tops and seconds in order to create consistency in such details. 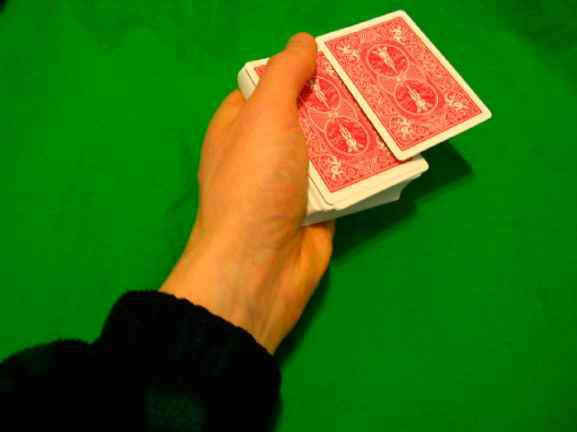 It is also important that when the card turns over it does so parallel to the deck so as to maximize the economy of motion and not twist, which it may have a tendency to do when you first begin practicing. You will notice that executing this deal is not silent, there is a snap as the one corner of the card releases, and the revolution occurs. This is a good thing, if you handling doesn't include this snap you are doing it wrong and it is important for the sake of the later second deal that you alter your handling in order to create this sound. It is also noteworthy that the action responsible for this sound is one of the actions that make this deal so deceptive because the revolution occurs so quickly. Keep in mind; though I broke down the steps for you in the description, the actual deal itself occurs extremely quickly with almost no time gap between the actions. While it is valuable to practice the deal slowly in front of a mirror to ensure your handling is correct you must ultimately speed it up significantly after all, the point is to create an invisible deal. Those details addressed I shall continue on to the second deal. You begin in the same manner with the second deal as you would with a top, except that rather than riffling off one card you riffle off two obtaining your break under both of them. Again, as per dealing tops your thumb is inserted into the break to the point where it is roughly halfway across the card. A point of interest here, you want the top cards aligned to the far right edge of the deck, often there is a tendency for them to slide slightly to the left, which will hamper your deal later. 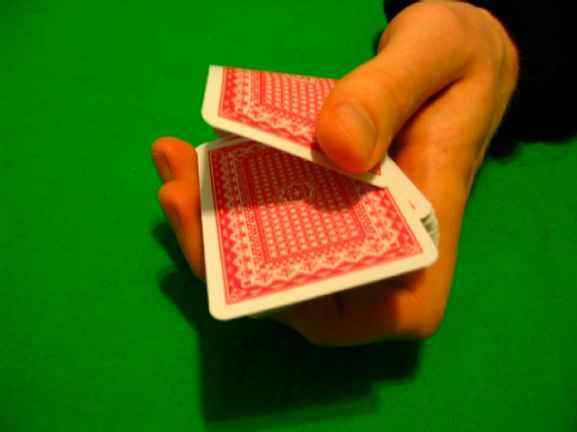 By inserting your thumb first, you raise the left side of the cards so they are at an angle and will naturally slide into the right edge alignment you desire. Next, as per the top deal, your middle finger, ring finger, and pinky will press down on the cards at the edge. This process is important because during the second deal they will hold this top card in place while the second card revolves in a manner consistent with the revolution of a top card. Note that though visually this action is the same in the top deal and second deal the pressure is much lighter in a top deal because you are going to release while in the second deal it is being held in place. This is somewhat of a knack and feel thing that you will develop with practice. 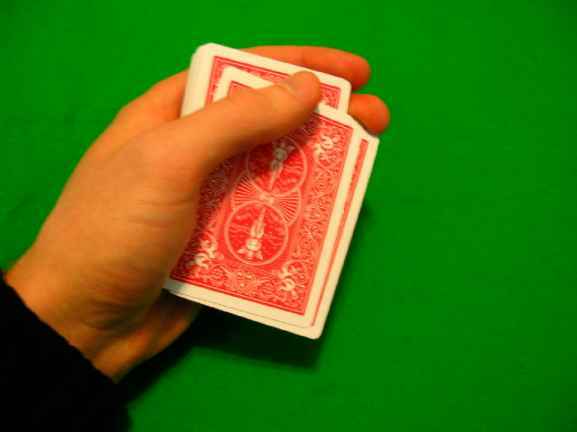 Consequently, to the actions of the forefinger, there will be a snap similar to the one in the top deal, but this time caused by the top card snapping back from its raised position and striking the deck. 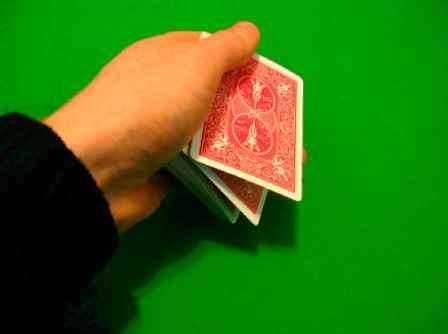 Again, I caution you about the finger positions on the card you have just turned over, practice making them the same as those of a top deal, altering both handlings if necessary so that they mesh. Just as in the top deal, you must revolve your wrist slightly while performing this action in order to render it truly invisible. Ensure that when the card revolves it actually appears to revolve rather than the common tendency for it to be drawn over the left edge of the deck and turned over, which is not only less deceptive, but inconsistent with the top deal. Practice both of the deals in front of a mirror until you are unable to tell the difference between the two. I assure you with this handling that it is possible, though it may take some work and experimentation. Finally, you may occasionally run into problems with getting the second card to pop out and revolve without drawing it left. 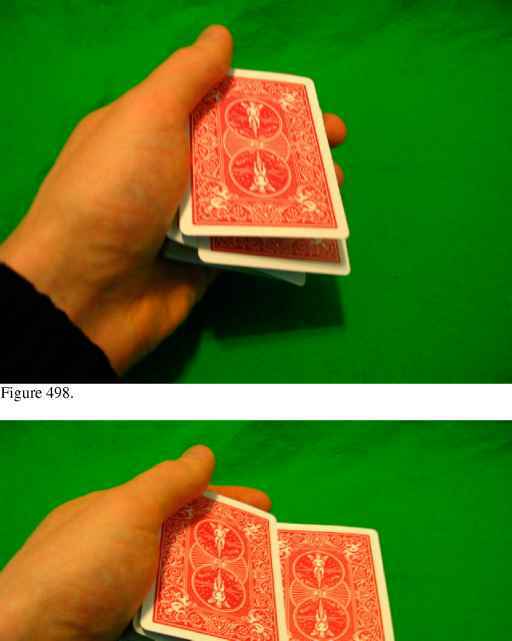 In order to correct this problem I find it is easiest to make use of your three last fingers on the right hand using them to draw the top card right and out of the way of the left card as allowing the top card to slip left seems to be a common problem responsible for this difficulty. If you continue having problems, try performing the strike with the forefinger farther to the left. This change will require that you shift your thumb at the same time, but will hopefully solve your problems. This is a beautiful deal if you learn to use it effectively and I hope that you do it justice. What can I say, spin dealing is my preferred method of dealing one-handed. Though it doesn't quite have the splendor of the D'Amico deal, it isn't a stud deal and is in my opinion much more flexible. I've never seen anyone else use the deal, it was an idea of my own, but given my limited knowledge of a decidedly vast subject I cannot assume I am the first to make use of the concept. I'm going to skip the potential variations, which are alluded to in the earlier section on dealing one handed and refer directly to the more flexible handling of the deal, as this is one of the few handlings from which I can deal tops, seconds, centers, Greeks and bottoms all one-handed. 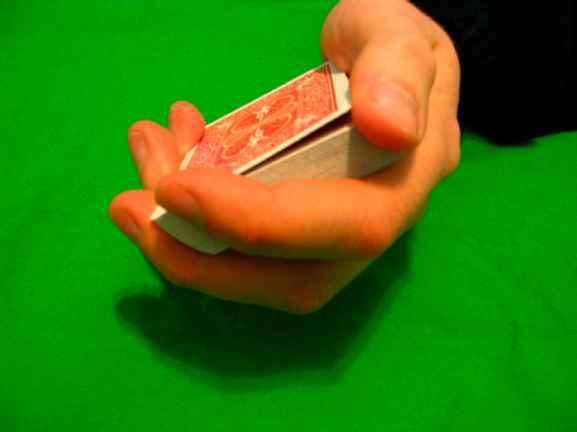 You begin by holding the deck in your right hand between your forefinger and base of the thumb as described in push-off seconds method one variation two. 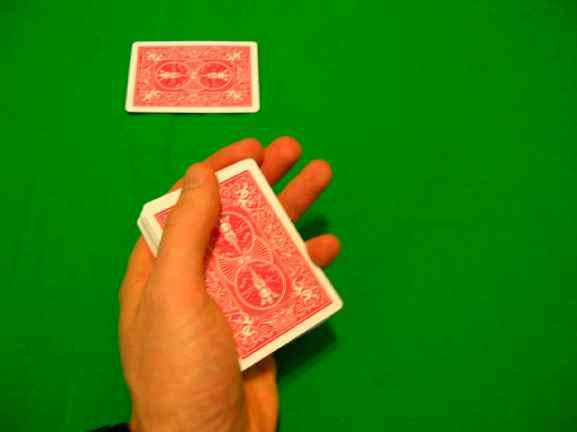 As in the reference handling, you will push-off two cards at an angle using your thumb, though generally, unlike in the original push-off handling, I tend not to use my pinky to provide a squaring force. 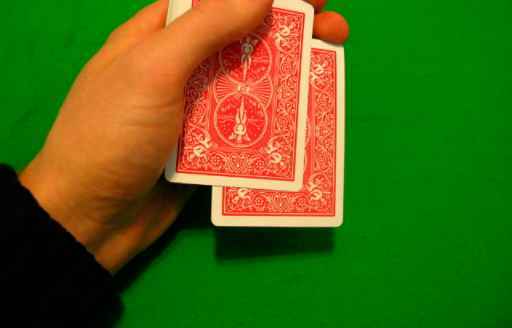 This is of course up to you, but I'd advise you refer to the original push-off handling to gain a good understanding of exactly how to perform the two card push-off. Naturally, if you are performing a top deal rather than a second you will push-off only one card, but since the handlings are so remarkably similar and I touched on the concepts of a legitimately deal twice already (once in the form of a basic spin top and once in the form of the two handed push-off), I will simply describe the second deal. You should probably practice this method by dealing tops first before progressing to dealing seconds. 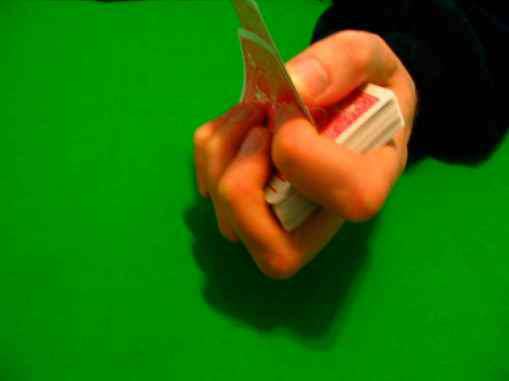 You'll find that the flinging action of the middle and ring fingers almost involves pinching the card in order to facilitate a rapid pivot followed by the release that sends the card flying across the table. 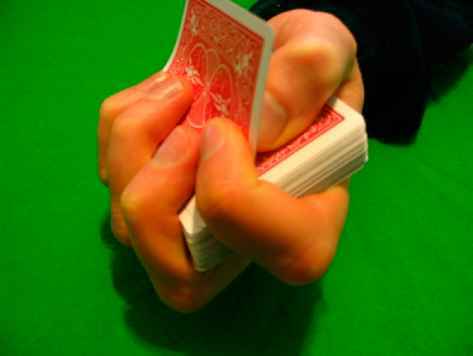 In order to ensure that the correct number of cards are pushed off during the initial push-off action, as the forefinger is not the best for controlling such things, you may make use of your middle finger to help separate the top card or two from any others that may stick together. 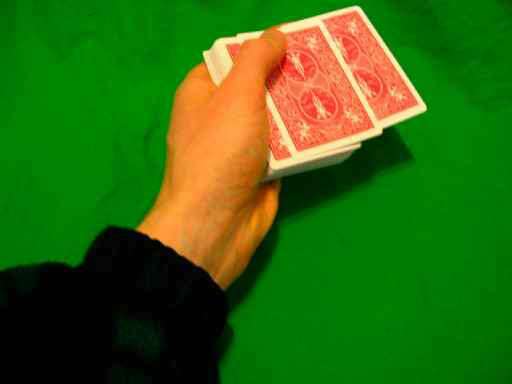 This process is a strict matter of timing as you don't want any observers to see you pull back the top card, or to see that the card is not in fact coming off the top of the deck. While the larger action of the hand and wrist help to cover this, you should choreography the motion so the visibility works as follows. 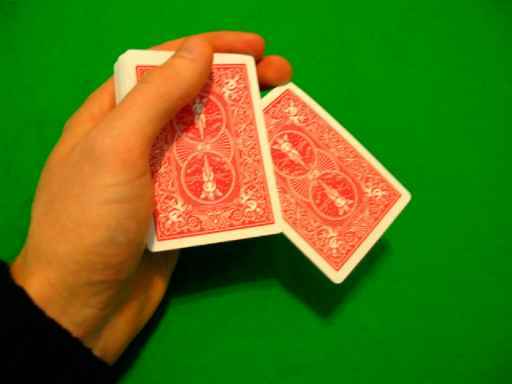 The deck is visible and you begin to push-off the card or cards. Now the deck tilts back slightly and curls inward so the top is no longer visible. The thumb pulls back, the fingers flick out, and the arm uncoils again revealing the top of the deck. 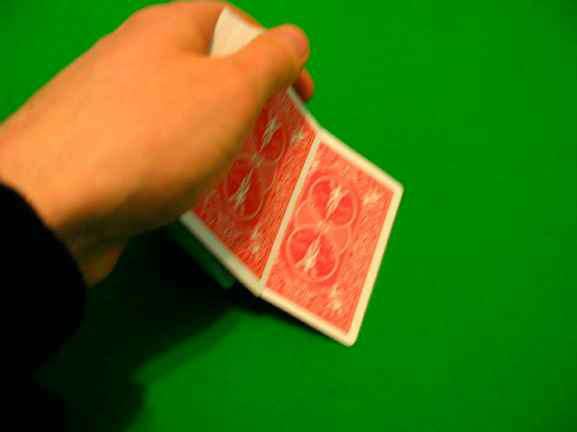 If you handle this correctly, the period where the top of the deck cannot be seen is very brief and not at all suspicious due to the manner in which the flick of the wrist assists the toss of the card. The weakest angle then is to your right if you are dealing with your left hand as I do, or to your left if you deal with your right hand, caution should be exercised then that your angles, the direction you sit facing etc. are appropriate while performing this deal. With practice you can learn to perform the deal fairly deceptively even without the use of such angles but it is not advised. Also, be cautious about how much you tilt your wrist, while twisting in a lot is good, tilting too much will cause problems later for a bottom deal. 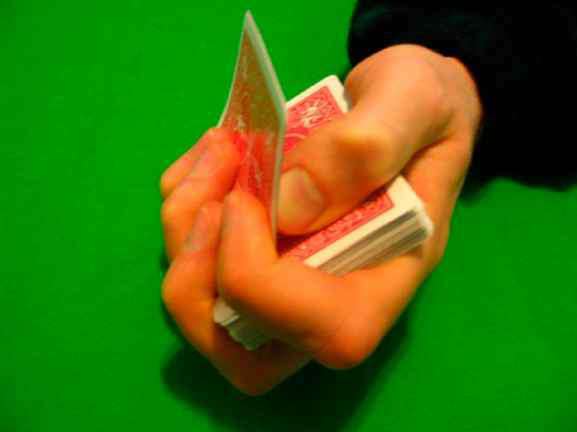 In order to determine where the card flies, that is to say, to which player (and it is important that you learn to control the trajectory of the card, for there is little more embarrassing than trying to show off with a one-handed deal and having the cards go all over the place in a chaotic manner), you can apply a principle similar to that of pitching a ball. In other words, the place you end up pointing at the end of the deal is where the card will sail (roughly). 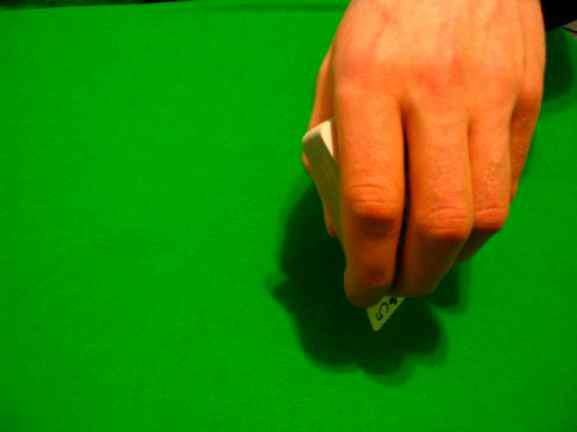 Naturally, the way in which you control the flick of your middle and ring fingers will impact this point, but generally by uncoiling your arm in such a manner that you hand points to the desired player you can easily direct the card to them. Again, this is not something that is likely to come in your first hour of practice, you will need to spend some time gaining a feel for the technique until it is merely second nature and you are able to deal rounds of poker in this manner all day without thinking about it. Finally, there is the issue of the silhouette created by the card you are pulling back with your thumb as you deal off the top card. Hopefully, this is invisible due to angles, but in the event that it is not I figured I should cover it. 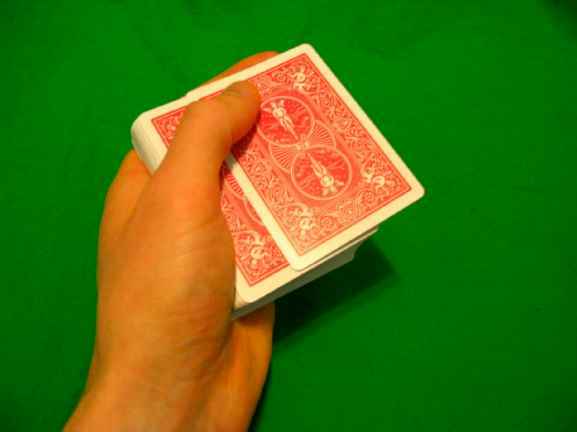 First, it is noteworthy that the silhouette is not as bad as it would be with a two handed deal since you cannot pivot the card back directly, the middle finger is in the way. This requires that you pivot it back by drawing it slightly to the left and then forward while pivoting slightly to avoid contact with the middle finger. Thus, the flash is brief and minimal. In addition to this however you have the natural cover I wanted to mention, namely, at the time when this action occurs, your middle finger is stationary and thus blocks any possible corner flash that may otherwise be visible from the front. Ultimately, this leads to one of the more deceptive and effective false deals as well as a nice flourish for those who are willing to put in the effort to learn it and learn it well. We'll return to it numerous times later as we examine various other false deals. I consider this method quite impractical and thus I shall not digress upon it at any length. Rather, I wished to share it with you in hopes of inspiring future ideas on the subject of dealing one handed. I find that when toying with cards, thinking about ideas etc. I will initially find a concept to be difficult or seemingly impossible, but once I get the initial concept worked out, ideas fly at me by the dozen. It was the case here, when I was considering one handed dealing and the difficulties it offered as well as, I think, various magic sleights that all sorts of ideas began coming to me and I stumbled upon or developed half a dozen or so methods of dealing seconds one-handed, of which this is one. I find it quite frustrating at times because when I will dedicate myself to the subject I have on average five ideas per day, which I record, but have no time amid everything else to explain in detail and expound upon. In fact, generally I have time to cover only one per day and thus find myself getting behind by four ideas per day. Thus, I often end up either abandoning the subject out of frustration or at least shutting myself off to the consideration of new ideas once it becomes overwhelming. This may ultimately mean that I do not discover some ideas I might have considered brilliant, but by contrast, I will at least, be able to record those ideas that do come to me, I hope. It is important that this all occurs quickly and in a fluid motion. Also, the weak angle is the angle where the top of the deck is visible thus anything you can do to reduce audience view of the angle is advantageous. I consider this deal impractical and so I shall not pontificate upon it further, however perhaps you will be able to make something more of the concept and render it useful. I should perhaps begin by apologizing, the name is, I must admit, less than creative, the same goes for the spin deal, which I debated renaming, perhaps gyration deal would have been more interesting, but it also seems odd even by my standards, trebuchet deal might have been a better name, but it doesn't feel appropriate. So, perhaps out of a lack of creativity and laziness, you my dear readers are left with the unexciting title "spin deal" and now "throw deal".. .at least both are appropriate. The whole concept for this deal goes back, at least for me, to Marlo, who teaches a one-handed bottom deal, similar to the one I'll teach, in the DVD "The Legend". I'm going to cover this deal slightly differently since, while I included some rough concepts in the section on throw dealing and push-off seconds method two, there are some subtleties you should be aware of for this deal which is really a fairly decent one-handed deal. 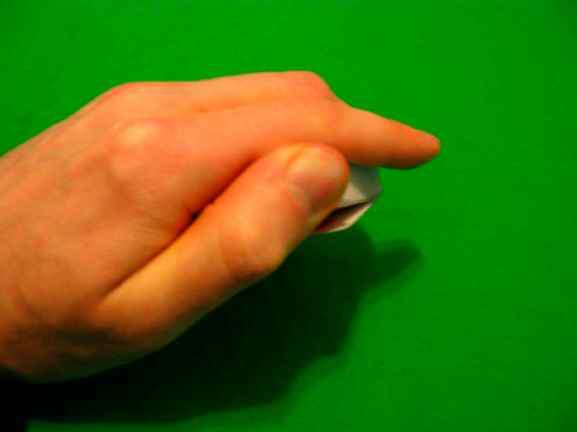 To begin with, you have the grip, which is really the tested and true grip from earlier and involves holding the deck securely between the forefinger and base of the thumb. (For those who are familiar with it and feel it is more comfortable, you may shift the deck slightly lower in the hand and make use of the master's grip). This grip was described in push-off seconds method one variation two if you would like to refer to it. Now this grip actually isn't important or necessarily ideal for the throw second, but since we are going to learn later to perform throw bottoms and centers where this grip is necessary I've decided to use it here. For those who have no interest in one-handed bottoms or centers, a mechanics grip offers slightly more stability. 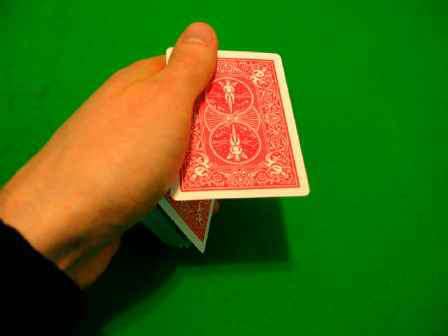 From here, your thumb, which normally rests across the top of the deck, moves back to the left edge and pushes off the top card. (If you are comfortable pushing off two cards from around the center of the deck that is fine as well, I simply find pushing off two cards as one at the edge of the deck to be more comfortable). You should push the card off roughly halfway and ensure it remains square with the deck. 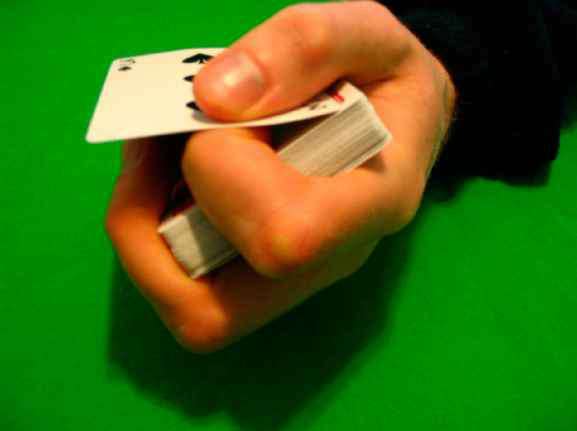 At this point, the last three finger tips of the hand should be on the right side of the deck just high enough that the card is resting on top of them without creating a visible gap from the front, in other words, the fingertips are not lifting the card off the deck. Now, at this point your hand will pull back and prepare for the next deal. I should point out that due to the function of this deal you probably don't want to perform certain false deals to certain individuals, or in certain circumstances, though I will emphasize this point when it is of greater relevance on other false deals. Paul LePaul came up with what is called bullet dealing years ago, it's a nice flourish and an interesting deal, but using it as a false deal is questionable. I've not read his comments on bullet seconds, but I understand he mentions some ideas along these lines in "The Card Magic of Paul LePaul" published 1959, though having not read the book I can't confirm this source. However, since the bullet deal is credited to him as far as I can tell it seems logical that the bullet second deal would also be credited to him. When I heard someone mention that he discusses how to perform a bullet second deal I decided to work on the concept myself, after all, it's an interesting concept and always nice when you're false deals flow naturally from the same method as your real deals. Now, while I have yet to fully eliminate this problem, I will offer you a couple suggestions to help avoid it, beginning with the worst, and ending with the best. The first consideration is that immediately after bullet dealing off the second card you press downward with your thumb in order to eliminate the profile of the other buckled card. The problem with this I find is that you have a tendency to catch the second card and ruin the deal. In addition to that problem, I find it isn't the most deceptive method even when it works, however, you may experiment with it and perhaps garner a greatly level of success than I have. Second, you may perform what I call an illusionary quick deal. In other words, you bullet deal the second card in the deck to one player and immediately without pause deal the top card to the next player. Basically, what you are trying to do is create the psychological impression that either you actually dealt the top card and were simply very quick on the get ready for the next deal. Or, that you unintentionally pulled back two cards as one and are simply proceeding with a regular deal, in which case your manner should be casual as though you messed up and you are trying not to let it matter. This option no matter how you twist it is less than ideal but it gives you something better than a really obvious second deal. Finally, you have a third option which takes place more on a technical level. The idea, is to fire off both cards and stop the top one. The manner in which you will do this, is to buckle both cards at the front with the tip of the thumb, then to release them, but rather than performing a traditional release, you'll adjust your thumb, releasing with the tip in order to make contact at roughly the joint. This is not the world's easiest process, but it is certainly an effective process if you take time to learn, or perhaps you will find a better method, perhaps LePaul or someone since has developed a better method. I'm not going to mention much here but rather refer you to earlier methods. 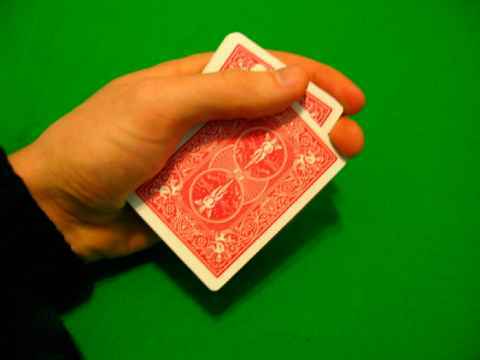 Generally, the concept of one-handed stud seconds is simply to turn your hand over as you perform the deal and that's roughly the technique here. Of course, I don't have to mention that the D'Amico deal was really a stud or blackjack deal and you could use it as such. I invite you then to refer with me to the throw seconds as a starting point. The beginning mechanics are the same, you will hold the deck securely and push off the top card to deal a top or the top two cards as one to deal a second. Now, rather than moving your hand suddenly, you are going to move it to the place where you wish to perform the deal and then execute the procedure as follows. Revolve your hand at the wrist as though turning the hand palm down (so the top of the deck is directed towards the table). The revolution of the hand should occur in such a manner that your thumb ends up closest to your body. In other words, you will revolve the hand clockwise towards yourself. You are doing it this way in order to conceal the top of the deck as best you can. 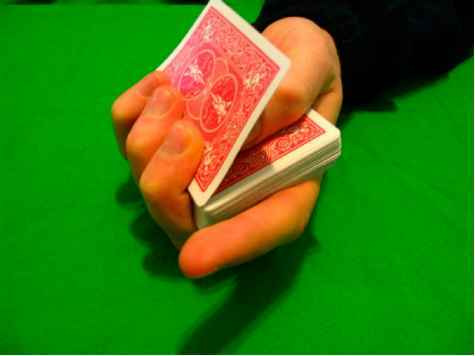 Now naturally, if you're dealing seconds, you need to pull back the top card, you will do so at the earliest opportunity possible, in other words, you pull back the top card in the motion of revolving your hand as soon as the top of the deck is no longer visible. There are a few points worthy of consideration here. First, make sure you pull back the card square with the deck, second it back completely and securely. The reason for this is that there is a tendency for the pressure (weight) of the second card to pull the top card down slightly and for the top card to flash as you deal the second card to the table. If you look at this in a mirror, it will appear much as if you are holding a break. Turning your wrist back immediately a quickly also helps to disguise this fact. That then summarizes the stud second deal, simply a two-card push-off with top card pull back version of the top deal. For those interested, you may apply the same principle I mentioned here, to a spin deal in order to make it a stud deal, though I tend not to use that technique very often.